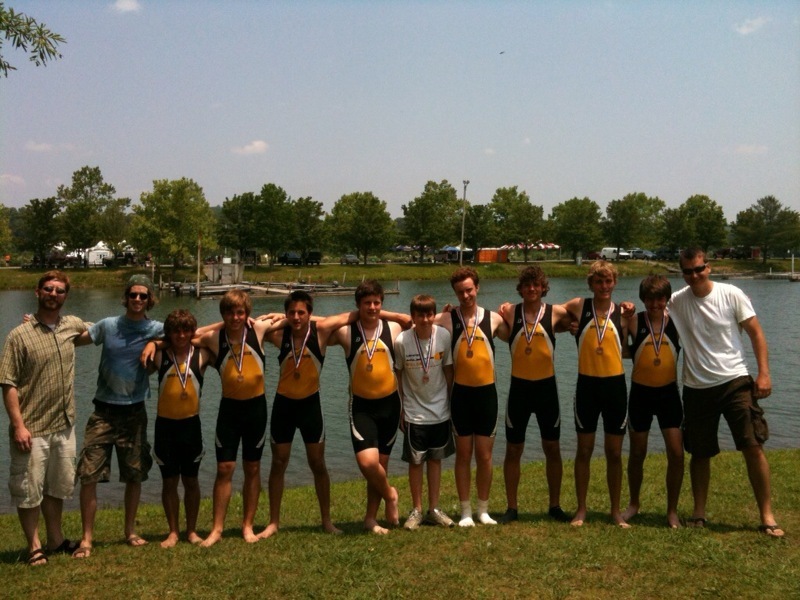 Henry is home from Providence for a few weeks (see picture below - click to enlarge) and filled in for Peter this past weekend while he was away competing with his crew team at the Midwest Scholastics Rowing Championships in Oak Ridge, Tennessee. He struggled a bit with mechanical problems but had fun in the process. Conor had an excellent day with a heat race and feature race win. A full race report will follow. 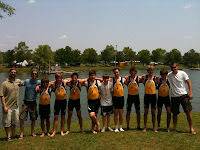 Peter and his teammates in the Boys Freshman 8 boat (see picture below - Peter is fourth from the left) qualified for the Scholastic Rowing Association of America National Championship Regatta in Camden, New Jersey, next weekend. More on that later, too. NEWS – The start of the 2011 Bruce Brothers Racing season was Mid State of Ohio Kart Club (MSOKC) Race No. 1, which was a qualifying format event at Circleville Raceway Park (CRP) on Sunday, May 8, 2011. Yes, this was Mother’s Day. Being on the MSOKC Board of Directors, I have some say-so regarding the season schedule, but I was out of town for the meeting at which the schedule was finalized. Needless to say, I would not have voted for a race on Mother’s Day. Laura was not feeling well, so she stayed home for some much-needed rest. Peter graduated a class and came to grips quickly in our reconfigured Spec 100 Pipe kart after we sorted out a significant mechanical gremlin. Conor has a rebuilt engine and gearbox for our 80cc shifter kart and was fast all day. PRACTICE – It was nice to finally see the sun shine last Sunday after an unusually cold and wet Spring in central Ohio. Both boys had had one opportunity to break in engines and practice prior to Race No. 1. On Sunday, Peter went out for open practice to get in a few extra laps while Conor was content with his pace. Regular class practices went well for Conor, but Peter came to a stop on the second lap of his second session. The engine would run, but would not rev high enough to even engage the clutch. This sent us into a tailspin, but fortunately there was lots of help to be had. SPEC 100 PIPE – By the time that Peter’s new class was called to the grid for qualifying, we still had not sorted out the problem. Everything that could be changed without removing the engine from the chassis was changed. With the help of others, we finally decided to take the engine off and eventually found a broken wire between the coil and the ignition unit. Peter missed his qualifying session, but two other karts in his class also had problems, so a make-up session was allowed. Peter qualified fifth out of eighth karts in his class, just 0.4 seconds slower than the fastest qualifier. At the start of his heat race, the inside row got going much more slowly than the outside row, which resulted in Peter dropping to sixth on the opening lap. Peter locked up the rear brakes and had a half-spin while attempting an inside pass in Turn 3 on Lap 4, which dropped him another position. He ran the last few laps in clean air and lowered his best lap time to 46.962 seconds in the process. He inherited a position when another kart had mechanical problems, which resulted in a sixth place finish. The combination of Peter’s qualifying position and heat race finish earned him the fifth starting position for his feature. At the start, Peter managed to get out of line to avoid what was again a slow-starting inside row, which allowed him to maintain his fifth position on the opening lap. He gained a position when another kart had a half spin in Turn 3 on Lap 4. On Lap 8, he set up and executed an excellent pass on the approach to Turn 5 at the end of the long straightaway. He ran in third to the end for a podium finish in his first outing in the Spec 100 Pipe class. 80cc SHIFTER – Except for some fresh components, we started the 2011 season pretty much where we left off at the end of 2010 with our 80cc shifter kart. The class champion from last year has graduated to the SCCA Pro Formula Enterprise Series (http://sccaproracing.com/series.php?ID=fe) along with two of Conor’s competitors from previous years. We put new tires on for Conor’s qualifying session, and while he looked good, he reported that he was not able to put a complete lap together. As a result, he qualified second out of six karts in his class, just less than 0.1 seconds slower than the fastest qualifier. Conor made an excellent start for his heat race but couldn’t manage to get past the pole-sitter. He seemed to be content following the leader for the first few laps but turned it up a notch for Laps 5 and 6 (of eight) hoping to force the leader into a mistake. Conor did record the fastest lap in the process (45.479) but ran out of laps and settled for second. The start of Conor’s feature was almost a carbon copy of his heat race start except that Conor may have gotten a little bit better start than the pole sitter. With the frustration of his heat race still in mind, Conor tried an early move to the inside going into Turn 3 on the opening lap. He later reported that this surprise tactic would have worked had he not changed his brake bias towards the front. Conor once again settled into second, but it became quickly apparent that a chassis adjustment we had made prior to the start of his feature was working – he was all over the leader from the very start. Conor was able to stick his nose in several times at several places but the leader was doing a through job defending. On Lap 6, Conor got a good run through Turn 9 and was setting up for a late apex into Turn 10 when the leader come over into Conor’s path. The leader’s right rear contacted Conor’s left front, which lifted Conor’s kart onto the back of the other kart. Both karts ended up in the infield, and while the other kart was stranded with damage, Conor was able to continue. He lost about 10 seconds in the process and dropped to fourth. Unsure about damage to his kart, Conor took it easy at first. He was able to reel in the third place kart by the end but finished fourth. Conor again had the fastest lap, which was about a second faster than the eventual winner. Peter finished his feature race on the podium (third) last Sunday in his first outing in the Spec 100 Pipe class (see photo below - click to enlarge). Conor was the fastest kart in the 80cc Sifter class, but got into a tangle going for the lead late in his feature race. He recovered to finish fourth. A full race report will follow. Peter takes his initial laps in the reconfigured Bruce Brothers Racing Spec 100 Pipe kart during pre-season testing at Circleville Raceway Park - May 1, 2011. All MSOKC events will take place at Circleville Raceway park (CRP), which is located just north of Circleville, Ohio, on Route 23. The CPGP will take place in the streets of Commercial Point, Ohio. Conor returns to our 80cc Shifter Kart, which has undergone a complete engine and gearbox rebuild. Peter will graduate to the Spec 100 Pipe class, which required a reconfiguration of the kart he drove last year. We look forward to seeing you at the races!